The first step in the decision-making process is to define the situation that you need to make a decision about. Situations are the separate events that make up your life. Each decision you make depends on the situation in which you find yourself. The symbol we use for a situation is the letter “S” inside a circle. The circle surrounds and isolates the situation. The curves of the “S” link the elements of a situation: external (facts) and internal (feelings). Symbols are vital tools to for both explaining and emphasizing the six steps of the Thresholds decision making process. The circled S shown on this page is used to introduce the first step of that process during one-on-one sessions. But it has a silent partner, shown immediately at the left. We call this the objective self awareness symbol, and we first present it to inmate clients during the macro (group) sessions. Later It comes up often in one-on-ones because the client mentions it of his own initiative, thus verifying his progress and understanding. What were the roots of your current incarceration, or of any particular situation from your past experience? We offer a memory acronym of CARD to help personalize the review. C – Chance…a sheer accident out of your control. Lottery winner. A – Assumption…taking something for granted without considering alternatives….Tom is always on that street corner, so I’ll meet him. R – Reaction….Unconsidered, often emotional response…All my cars should be red. D – Decision…Action based on careful consideration of alternatives and results. 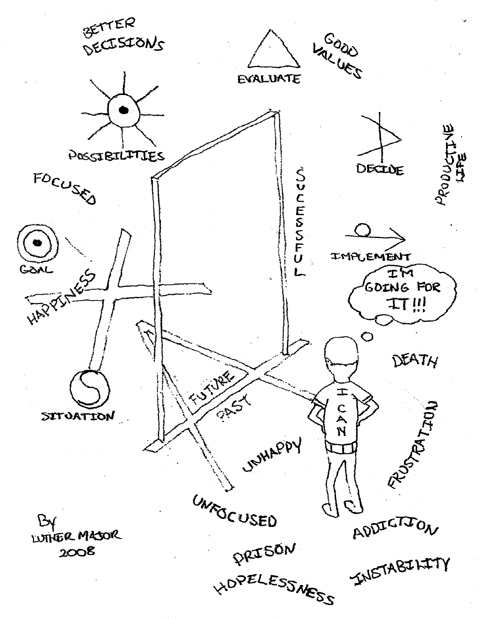 Symbols of all 6 steps in the decision making process surround the Thresholds symbol, through which the student inmate must pass in order to improve his living style. Accompany ideas sketched at random are tools to help perfect the process.